Vinyl Color Choices - Your business deserves to be seen...Let us make you VISIBLE! Your business deserves to be seen...Let us make you VISIBLE! This is our intermediate and most popular line of vinyl. It is High Performance and rated at 6 years for outdoor use and virtually a lifetime indoors. We also offer an extended outdoor use vinyl that is rated at 9 years outdoors, please contact us for more infomation on that line of materials. Pricing quoted on our website are for the intermediate line of vinyl unless otherwise noted. Colors below are in a glossy finish with the exception of those that are noted as being matte. Due to color restrictions and computer monitor calibration variations, vinyl may not match these swatches. These are for reference only. 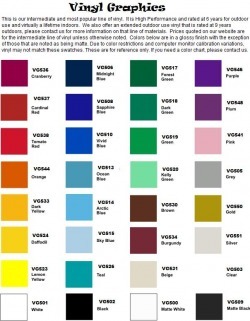 If you need a color chart please contact us.